Many shared ownership arrangements break down because of arguments over how much each person contributes (either in money or time), who is responsible for a certain aspect of care (such as arranging for the horse to be shod) or when the horse can be ridden. Recording the arrangement in a written agreement like this one may seem overly formal, particularly between friends, but it can prevent and resolve arguments and upsets. 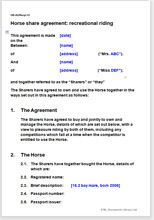 This easy to edit horse share agreement is full of practical matters, some of which might have been overlooked without it. Horse sharing is a fantastic way of reducing the costs of ownership: both financial and time. However, many informal arrangements turn sour because of disagreements about responsibilities for care, access and use, and who contributed what. Often, friends who decide to buy a horse for recreational purposes don't write down the terms they agree (or think they agree). Most casual arrangements end in disagreement. You might find that you pay a greater proportion of the costs than you originally agreed or that you spend so much time looking after the horse that you become the groom in the relationship rather than a co-rider. Frictions like these usually end the friendship as well. This agreement sets out ownership and responsibilities. It covers a lot of points, and is suitable for both high value and low value transactions. While we recommend recording the deal as fully as possible, because a long agreement may be excessive for an inexpensive horse, you can easily edit it to a much simpler document. We haven't used any legal jargon, so the document doesn't come across as being overly formal for an agreement between friends. It will however, protect your investment in the horse, and help prevent disagreements much better than an informal arrangement. This document is suitable for sharing arrangements where the horse will be ridden recreationally. One or other of the owners might enter the occasional competition, but the rationale for ownership should not be to compete. You should ideally consider the points in this document before you commit to sharing, and then finalise the document soon after. We suggest writing brief notes between you as to what is important to both of you (for example, one person might not want to deal with a farrier, or it may be important that one of you has access on Wednesday afternoons for a club hack). Consider the areas where something may go wrong with the proposal or your relationship and ask “What would we do if . . .” Those issues must be covered in the way you want. There are a greater number of issues to consider if the horse is to be ridden in competitions. If this is the case, then Horse sharing agreement: competing may be more suitable.